The Stealth Uses Just 0.8 Gallons Per Flush! | C.J. Erickson Plumbing Co. The Stealth Uses Just 0.8 Gallons Per Flush! 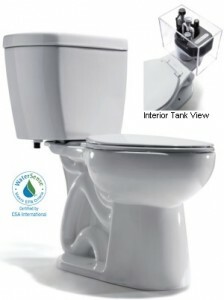 The Stealth UHET (Ultra-High Effiecient Toilet) from Niagara Water Conservation uses only .8 gallons of water per flush. C.J. Erickson Plumbing is proud to be a local distributor of Niagara Water Conservation products. At .8 gallons per flush, most of us in the service department were skeptical about how The Stealth would perform. So, before endorsing the product and displaying it in our “Showroom That Works” we needed to perform our own ‘real world’ tests. The Stealth has been in our plumbing showroom for 2 months now and we’ve had great results. The Stealth is flushed at least 20 times per day with both solid and liquid wastes. There have been no clogs or back-ups to report, and all of our expert plumbers are very happy with the Stealth’s performance. It’s important for us to point out that while we’ve had good success with The Stealth, it may not be right for every household. If you’ve had sewer problems in the past and your underground piping is not in the best shape, you may want to stick with a conventional 1.6 gallon per flush toilet. The Stealth UHET does a great job of flushing with low water volume, but the reduced water volume might lead to problems in some plumbing systems. If you are intrigued by the Stealth but aren’t sure if it’s right for your home, come in to our plumbing showroom where you can test the toilet, see how it works and learn the difference between a .8 gallon flush and the 1.6 gallon flush. If the Stealth is the right product for you, buy it in our showroom and a C.J. Erickson expert plumber can help you with installation. Niagara Water Conservation also offers other toilets, along with a number of showerheads and faucet aerators. Stay tuned… I’ll blog about another cool technology from Niagara next time. Stop by our “Showroom that Works” at 12100 S. Cicero Ave, Alsip, IL to see The Stealth and other water conserving products in action.